This rare vintage model F27 desk lamp was produced by Artimeta Soest in the early sixties. It was most likely designed by Floris H. Fieldeldij. 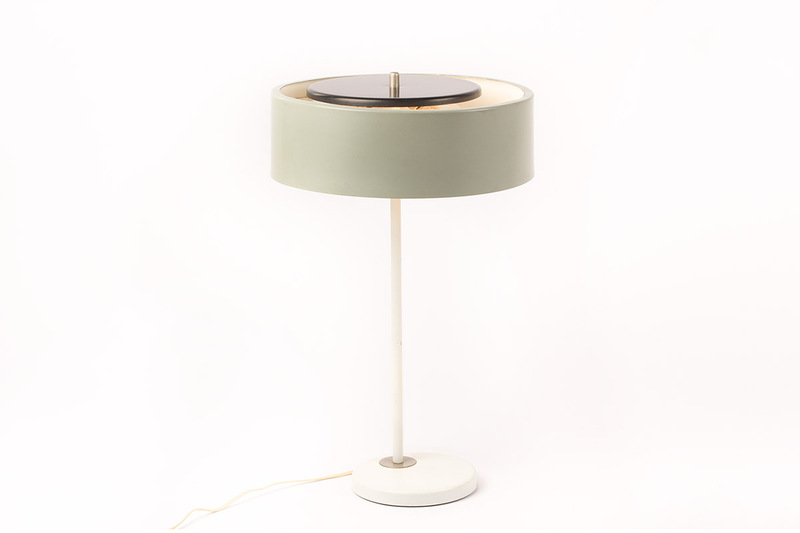 The lamp has a very nice design which is almost similar to the 243 table lamp for O-luce designed by Giuseppe Ostuni. This desk lamp is in an good and clean original condition with some small signs of age, There are two lamp holders underneath the black top shade with on/off switches in the lamp holders. The color of the shade is grey-green. Dimensions: 48 cm high, the diameter of the shade is 30 cm. The price is 325 euro.